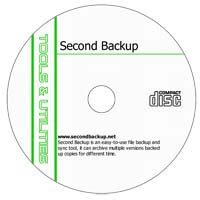 Second Backup is an easy-to-use file backup and sync tool, it can archive multiple versions backed up copies for different time (for example, the first copy for Monday is Backup the second copy for Tuesday is Backup. Automatically backup your important data (includes opening/using files and folders) to external hard drive, USB disk, network, and other storage device. Intuitive interface makes it easy to use, simply tell it which file or folder to backup, where and when to archive them, then it works reliably in the background and uses very little system resources. The backup task can be directed only copy the new or modified files, it monitors the source files and automatically backups the new or changed file to the destination. Automatic scheduling includes specific days of the week, days of the month, hours of the day, or any desired time intervals. E-mail notification lets you know the file backup status anytime and anywhere.